MEET ME IN THE GARDENS @The National Botanic Gardens 24th June – 11th July (2018). 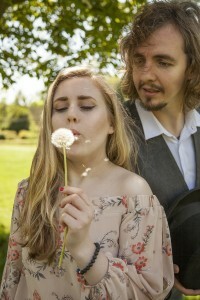 Actors Karen Kelly and Rory Dignam in Meet me in the Gardens. Will Medical student, Finn, be able to stomach digging up fresh corpses for Professor Trollope? Will James expose Mary McCoy’s secret bustling side-business? Will Molly’s date work out, or will it be back to the Tinder drawing board? This summer, plunge into the gripping 200 year history of Ireland’s National Botanic Gardens. 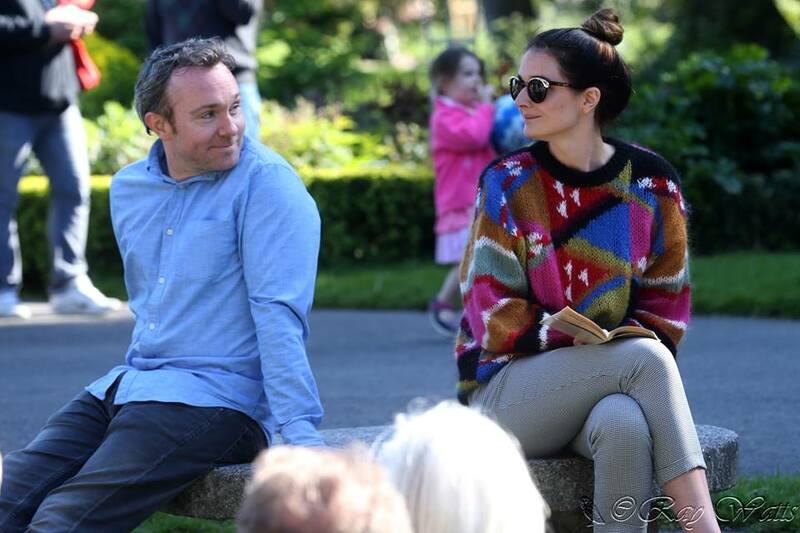 Shiva Productions, in association with the OPW and support from Dublin City Council, are bringing to life a new site-specific theatrical experience, digging up the ghosts of the gardens’ riveting past. Based on true events and real life characters, spanning the cholera epidemic to the onset of World War II, audiences will be taken on a thrilling ride through time before being jolted back to our technology-drenched present. within the picturesque grounds of the National Botanic Gardens, Glasnevin. Written by Sharon McCoy, and Directed by Aoibhinn Marie Gilroy. Cast: Claire Blennerhassett, Rory Dignam, Karen Kelly, Joe Purcell, and Cathal Quinn. Sunday 24th June – 2pm & 4pm. Sunday 1st July – 2pm & 4pm. Saturday 7th July – 2pm & 4pm. Saturday 14th July – 2pm & 4pm. Note: The performance is not seated. Portable chairs are allowed, rugs to sit on are welcome, and umbrellas are advised. Wheelchair accessible. Rob Harrington and Charleigh Bailey perform Forgiveness by Owen Fitzpatrick. National Tour Angels in the Park II (2016). Shiva Productions is a Dublin-based touring theatre company, formed in 2011, committed to exploring off-site, new writing, and devised work. We believe an audience is seeking an extraordinary experience when they come to a live theatre performance, and we strive to meet that expectation. While our work is uniquely Irish, we aim to capture the universality of human experience, so that our work can resonate on an international stage. We are particularly interested in exploring performance in ordinary everyday spaces. Through this work we aim to challenge the public’s perception of theatre in terms of where it takes place, and its relevance in people’s lives. We also aim to encourage new Irish writing, reinvigorate the classics for today’s audience, premiere exciting international work in Ireland, and work with actors and artists of all nationalities. So far we have staged work in conventional theatre spaces, and non-theatrical public spaces. Production Summary (See Production Page for more details). Angels in the Park II (2016) National Tour. Angels in the Park (2015) National Tour, London, Paris. Angels in the Park (2014) Axis Ballymun, Ranelagh Arts Festival. Angels in the Park (2013) Ranelagh Arts Festival. Breaktime Site-Specific Project (2013) Cinnamon Café, Ranelagh. 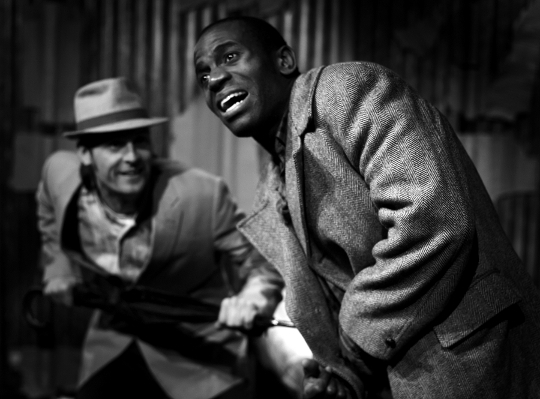 Blood Knot, by Athol Fugard, Project Arts Centre, June 2011. Kolade Agboke and Keith Ward perform in Blood Knot at the Project Arts Centre (2011).